Regular pasta salad is so last season. 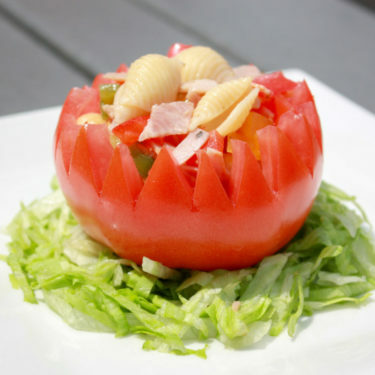 Bring your favorite Italian meats to life with this refreshing twist on pasta salad. With School Nutrition in mind, this recipe promotes meal components of 1oz protein, 1/3 cup grain, and 1/2 cup vegetable servings. Fill large saucepan with water, place on burner set to high heat. Bring to boil. Add shells to the water, stir to prevent sticking together and to the bottom of pan. Cook to al dente, approximately 10 minutes. Drain shells and rinse with cold water. Place in large mixing bowl. Add the vinaigrette to pasta, stir to coat and prevent sticking. Add remaining ingredients and stir to combine. Enjoy!